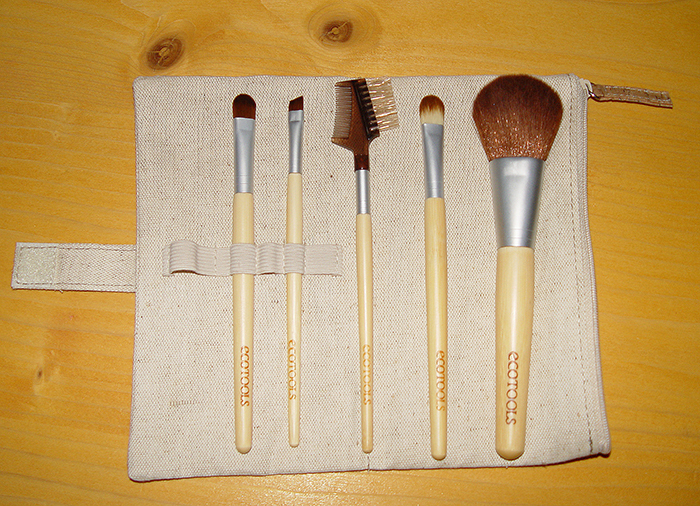 The set contains 4 small kabuki brushes in different shapes. 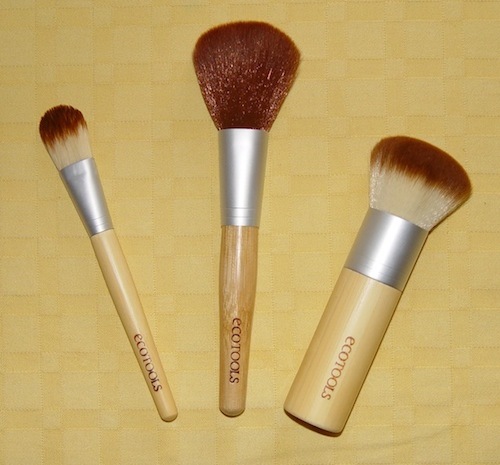 For those who don’t know EcoTools yet, they are eco-friendly brushes made from synthetic fibers and bamboo handles. Except this set, that has metal handles, which are very handy, because they aren’t too short. Every handle has a different floral pattern. The first brush in this set is the conceal brush, that it can be used for applying foundation or any cream product. The second brush is angled shaped bronze brush, ideal for shading with bronzer, especially on the forehead and cheekbones. 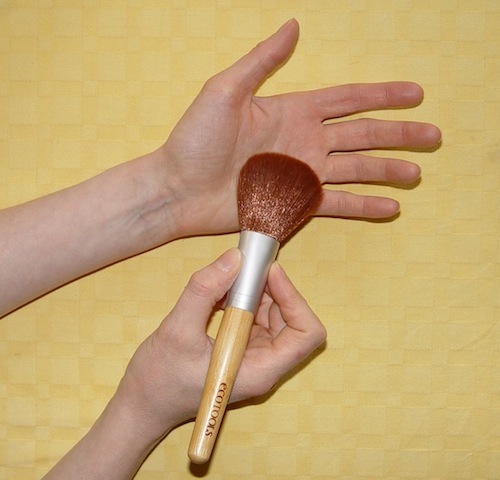 The third brush is called contour brush: I find it convenient for applying blush or for contouring the shape of the face. And the fourth – buff brush is cone-shaped and is great for applying mineral foundation or for finishing the entire make-up and get a flawless finish. Overall, I can say that this set is a nice gift idea, very handy for traveling and ideal for your entire face make-up. For those who still don’t have a kabuki brush, grab this great opportunity to buy this smart set until it is sold out, because of a limited edition. 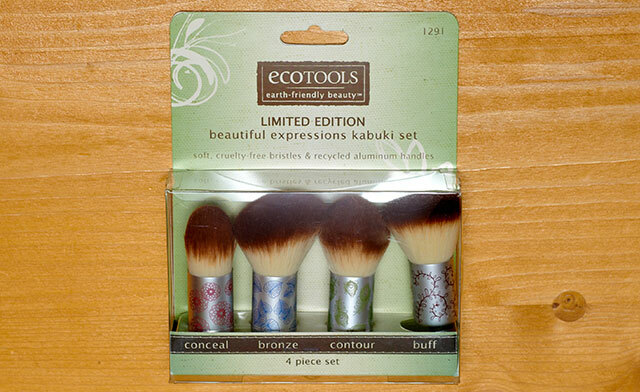 NOTE: I have purchased EcoTools brushes in Iherb.com online shop . If you want to purchase this or any other product in the Iherb.com online store, use this referral code DAS325 during checkout and you will save additional $5 on your first order. Enjoy your shopping! 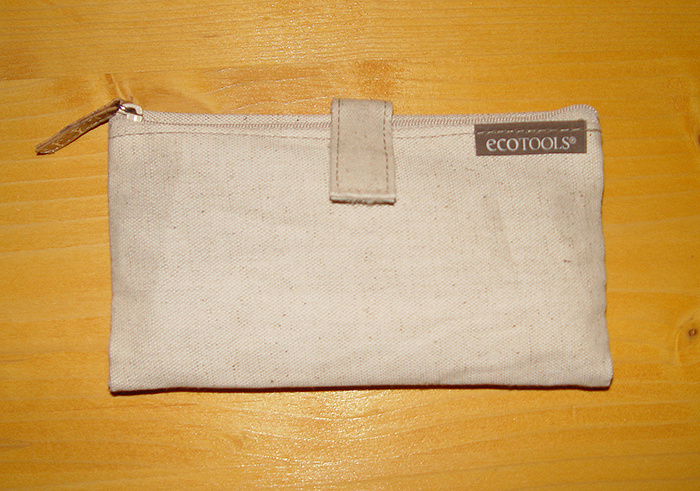 Here is my second part of the EcoTools story. As I said in the previous post, I wanted to try first a set of brushes. I realized that they are good, so I wanted to try other brushes that are sold separately. I was especially curious about the foundation, bronzer and powder brush, that didn’t disappoint me at all. I also purchased the set of cleansing sponges. Here I share my thoughts with you. This brush is very similar to the concealer brush, it’s just a larger version. I must say that this is my favorite brush from this trio. Regarding the length, it’s just somehow normal (not too long, but neither too small). The fibers are very dense and the tip is oval-shaped. The length of fibers is also appropriate, not too long. I don’t like foundation brushes with too long fibers, cause you can’t blend or control the amount of foundation while working on face. Because of synthetic fibers, you can easily use this brush for creamy blushes or other creamy products. I was interested in this brush for its form. It has a quite long and wide handle and a huge density of fibers. It’s very handy, especially for applying the bronzer on the body. It’s very soft and blends the product very good. It’s incredible, regarding the quantity of fibers, that when you wash it, it dries relatively quick. I can’t say this brush is a disappointment for me, but it’s a form of brush that I use less. It has long and quite dense fibers and it’s flat, not rounded. It’s meant to apply powder on the face (or body). I will use it for brush off any excess of powder on the face, for example, cause I am really not a fan of big powder brushes. I prefer to use a blush brush for the powder, that gives me more control and a precise application. But this is just my habit. My curiosity pushed me to try even these cleansing sponges. They are 12 pieces packed in a set. I was especially interested at how they look like and what is the feeling on the face when you use them. They are made with 100% cotton and natural soybean oil for cleaning the make up from the face. They’re washable and reusable. I have put the face cleanser on the soft side of the sponge and then, with circular motions, removed the makeup off the face. The feeling is good and you can wash, dry and reuse them. I can’t say how long one sponge lasts, but in every case, I think it’s not appropriate to use them too long (hygienic reasons). If you have any experiences with this brand, especially makeup brushes, I’d be happy, if you share them with me! 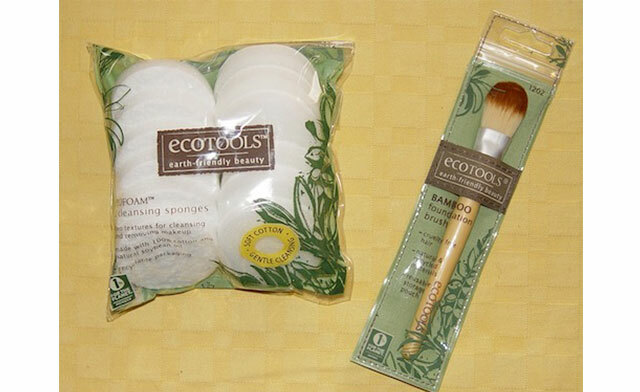 NOTE: I have purchased EcoTools brushes at iherb online shop . If you want to purchase them or any other products at iherb.com use this referral code DAS325 during checkout and you will save additional $5 on your first order. Enjoy your shopping! As you already know, I adore makeup brushes and I never have enough of them. On my way to become a green makeup artist, I decided to try more eco-friendly brushes with synthetic fibers and bamboo handles. I couldn’t pass by EcoTools. There are so many reviews about them, from good to bad ones. Beside my curiosity, this was another reason to try them. The main complaints were that the brushes don’t blend well the product or that you cannot pick enough powder. I decided to try first the 6 piece set and use it for more than a month. Here is my opinion about it. In other previews I noticed that the cosmetic bag was different and many users said it was not useful. I find this one quite handy. You can put it in your bag with all the brushes, plus you can store a few cosmetic products in the side pocket; mascara, blush in stick, stick foundation, lipstick and a gloss at minimum. In my opinion, this is really a nice all around makeup bag for a few touch-up products. What about the brushes? The first thing that I do when I get a new brush is to wash it with warm water and a mild natural soap. When the brushes are completely dry, I start to use them. I found all the EcoTools brushes are very good, especially considering the price, which is really affordable. During the years, I have collected a lot of brushes and I’ve usually spent a lot of money for each professional high quality brush. I think that the price of a brush is in direct proportion with the quality, even though I recently discovered a few cruelty free brush brands that sell very good brushes with a really convenient price. I don’t mean they are n.1 between makeup brushes, but you get definitely more than you pay. There is another thing I’ve noticed during my work experiences; many people think that the price of a product dictates the quality. Well, I don’t agree completely with this, although I am among the first to use high quality products. What I meant to say is that sometimes when I had to work for different brands of different quality, I had to do my job great in every case with any product. You have to take in consideration that not every bad opinion is measure for quality. The brushes have a bamboo handle and very soft synthetic bristles, that don’t shed at all. Until now I haven’t noticed even one hair falling out from the brush. They pick the product very good, but as I said you have to wash very well the brushes especially the first time, not just for hygienic reasons. The blush brush is a medium size brush for applying the blush on the cheeks, but I’d use it also as a powder brush, cause I prefer smaller ones for the blush. I especially like the size of the handles; they fit very good in the hand and they aren’t too short. I don’t like short handled brushes. I have to expose the angled eyeliner brush, which is in my opinion an amazing brush. You can draw a perfect line from the thinnest to the thickest. It’s very good even for the eyebrows. The eye shadow brush is flat with a rounded tip: a classic eye shadow brush. I apply even mineral eyeshadows with it and it works great. It is good also for the creamy products because of synthetic fibers. My second favorite from this set is the lash & brow groomer. It’s very precise, handy and solid. A must have in every makeup bag! The last is the concealer brush, which is good, too. At the beginning I wasn’t very satisfied, cause it really didn’t pick the product very well, but after washing and using it a few times, I realize that it’s a very good concealer brush. Maybe the bristles were somehow greasy, so that they didn’t pick the product, this is why you should wash the brushes frequently, especially after you buy them. In conclusion I’d say that this set of Eco Tools are nice brushes for a very affordable price. You can buy them in a 6 piece set or separately. The best thing is that are cruelty free and eco-friendly! 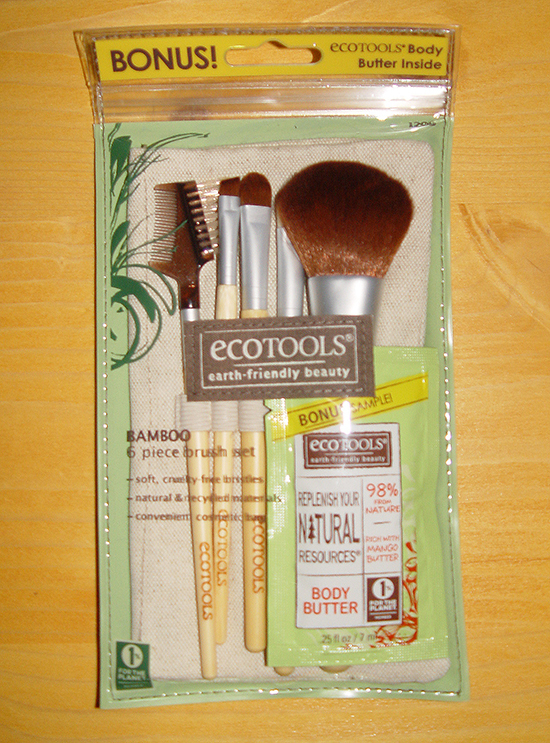 NOTE I have purchased EcoTools brushes at iherb online shop where prices are affordable. If you want to purchase them or any other products at iherb.com use this referral code DAS325 during checkout and you will save additional $5 on your first order. Enjoy your shopping!